This is the list of the 181 additional kanji you need to know to pass the JLPT N4 test. These are the kanji you need to learn on top of the 104 kanji required for the JLPT N5. 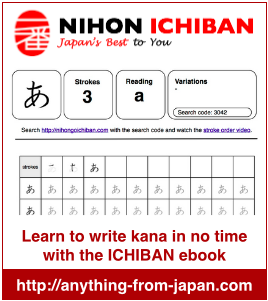 Click on the kanji and watch the video with the stroke order how to write it and learn from example vocabulary. In case you use a print out of this list you wil easily find the kanji on this website by searching the Code. nice work .this December I can finish my n4 in india tamilnadu……..thankyou ………..
Great job! Thank you so much for publishing this. Just finished with your list, thanks for the help! Great. I wish you good luck for the test. I don’t understand well, if your phone only support the latin alphabet does it mean you want a list of Kanji without kanji ? No, I meant to say that whereever the kanji appears , instead of putting it as a text font, a small image (enough to be visible) can be replaced in that place. Though the page may become a bit longer, it will help many such people who browse by non-japanese devices. Although clicking on the kanji link gives an enlarged image, but doing it 104 times would be expensive. (mobile internet is much costlier, at least where i live).So, it would be beneficial. This site is really gud and everything is available here just by one click…..
It’s good not only for learners but also the student taking examination such as me! Thanks for sharing this. Waiting for kanji of jlpt 3! where could i get a .pdf format of the list like the one from the JLPT N5 ? is it under construction or made ? You can print the list as a pdf. There is a small description how to do this at the bottom of the page I think. I’m also after this list in the same format as the one you’re offering for N5, with each kanji on a separate page and boxes to be filled in for practice. I’m all up for paying for such a e-book if that’s the case.